With so much activity, it’s best to check the events calendars to see what’s happening during your visit. Here’s a taste of what you might find. Chico’s creative arts community is bolstered by the presence of Chico State and Butte College. In addition to gallery shows, there are frequent special events, such as the Open Studios tour and Palio during Artoberfest in October and Art at the Matador in May, where artists display their creations in the vintage rooms of the Matador Hotel. We also love our music and theater, from wildly talented local performers to the internationally renowned. During April and May, enjoy the ever popular CAMMIES music competition held at venues throughout the city. In 2015 a rotating group of determined musicians played nonstop for the entire month of April in an attempt to make the world record for the longest concert. Foiled by a technicality, they tried again in 2016, going 16 full days. Enjoy theater? Chico has lots of it. A Chico iconic event is The Butcher Shop. Held late summer (usually late August or September) it features live theater and a bocce ball tournament. All free and open to the public. If you've never been, you're missing out on a fun community event. Visit their Facebook page for details and event dates. 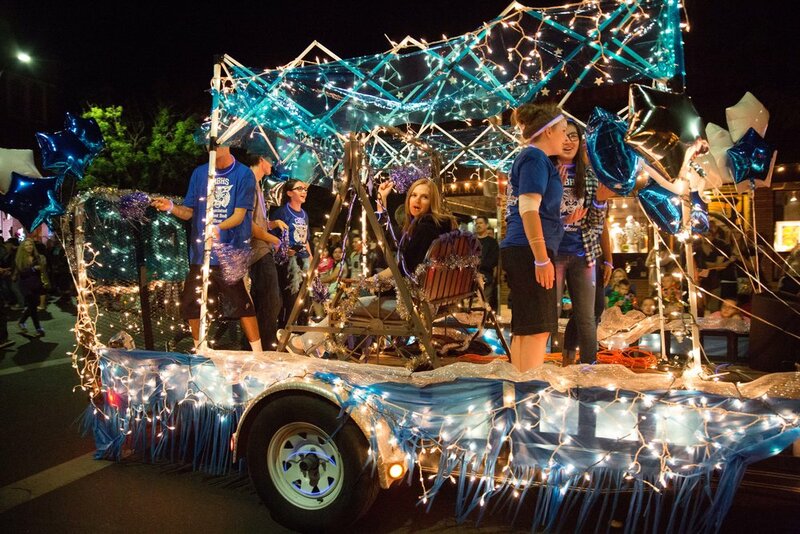 Held each October, Chico Parade of Lights is a feast for the eyes and delights Chicoans of all ages. 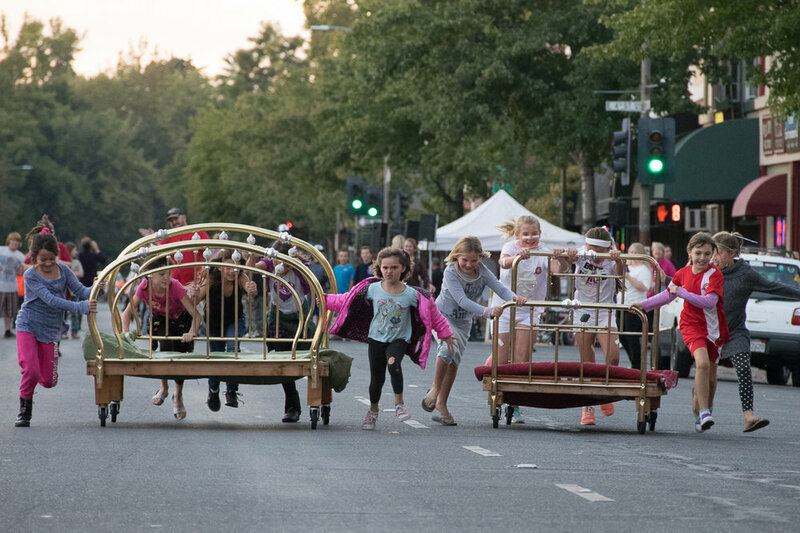 Held downtown, the parade features activities, food and thousands of lights as we usher in shorter days and cooler weather. Come join this family friendly annual event started back in 1989. Whether a spectator or participant (showcase your business or group or organization!) be sure to visit their website for details. Follow the Sierra Oro Farm trail and visit 30 farms and wineries in the Chico region during Passport Weekend in October or sample the fare of Chico restaurants at Taste of Chico, one of several Downtown events. Thousands of revelers show up for Sierra Nevada Brewery’s annual Oktoberfest. You'll find many chef inspired beer or wine pairing dinners throughout the year. These often sell out so be sure to check event calendars early for best tickets. With great weather nearly all year, it's no surprise you'll find an abundance of activities. You can find a cycling or running event nearly every weekend in Chico. The Wildflower Century and Almond Blossom Run are two of the better known events along with the Bidwell Bump mountain bike race and Bidwell Classic marathon. Check Chico Velo and the Chico Running Club websites for a schedule of events. The Pacific Flyway ranks as one of the greatest migratory pathways in the entire world, stretching from the Bering Strait off the coast of Alaska to the steeps of Patagonia in South America. Millions of birds representing hundreds of species use this great avian highway each year, and nowhere is this abundance of wildlife more accessible than right here in Chico. For 5 days in January, thousands of people descend upon Chico to learn and enjoy the Snow Goose Festival. Workshops, tours, bird-watching - its all available and family friendly. For four-wheel fans, sprint car races at Silver Dollar Speedway draw large crowds at its weekly Friday night shows starting in early April through the end of August. The Gold Cup Championship is typically in November bringing thousands to the racetrack. October finds weekly shows that include the 410 sprint cars, dirt modified and pure stocks. Other big events throughout the year include 3 days of racing during the Silver Dollar Fair and the annual July 4th race followed by fireworks. The Chico Heat is one of 6 teams in the Great West League - one of the premier summer collegiate wood bat leagues in North America. The league provides a professional, minor league- like atmosphere for top college players seeking professional baseball careers. The Heat is affordable, family entertainment. Games are played in the evening, taking advantage of cooler evening temperatures in Chico's Nettleton Stadium. Get a ticket, grab a hot dog and watch some youngsters play dizzy bat in-between innings. It's an evening the whole family will enjoy. Chico kicks off the summer with the annual Silver Dollar Fair. This week long event is held in May and attracts thousands every night. From carnival rides and farm animals to corn dogs and incredible art, this family friendly event is a tradition you don't want to miss.